New Delhi: With the disappearance of the magnificent Great Indian Bustard, this Earth Day was a glum occasion at the Karera sanctuary in Madhya Pradesh. Following the Centre's recent approval of a state government's proposal for denotification the area, comprising nearly 32 villages, would be set free for villagers to carry out sale and purchase of land and other commercial activities. 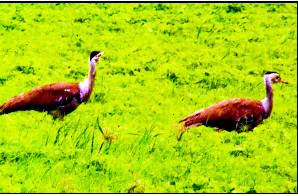 The National Board of Wildlife, chaired by environment minister Jairam Ramesh, in a recent meeting approved the state's proposal to denotify the sanctuary, after its officials said the bustard wasn't sighted since 1995 and that most of the land inside the sanctuary sprawling over 202 sq km was private land and people were facing lot of problems. "Notified in 1981, the sanctuary in Shivpuri does not have an inch of forest land. As much as 146.66 sq km is private land and the rest is revenue. As the villagers live inside the sanctuary, they can't sell their lands and are prohibited from activities like digging and transporting material," chief wildlife warden, R S Negi said. However, the approval has come with a rider-the board has asked the state government to declare Dihaliya lake and a portion of the adjacent revenue land to be declared as a sanctuary and probe into the reasons for the disappearance of the bird. The Great Indian Bustard, locally known as the ‘son chidiya' or golden bird is the most endangered member of the bustard family in the world and the total population in the wild may not exceed 700. Poaching and habitat deterioration are the two main causes for the drastic decline of the bird, which is now limited to Rajasthan's Desert National Park and the Lala-Parjau Sanctuary in Gujarat.